Bron Heulog (pronounced Bron hay-log - meaning Sunny Bank) is a beautiful, large Victorian house which stands in a steeply sloping terraced garden. The Victorians certainly knew a thing or two about building, the stone walls are 2 feet thick! 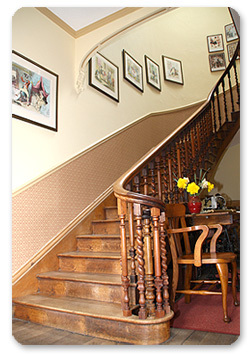 Many features of the house remain, including the magnificent curved oak staircase, and all the original fireplaces. It was built in 1861 for or by a wealthy landowner for approximately £500.00. Allen Ewerson Evans lived here with his family and two servants until 1897. From then, until 1994, it was mostly owned by medical practitioners, who used the house partly as a home and partly as a surgery. Garden Cottage was sometimes used as a waiting room. Peter and Diane Crocker moved to Bron Heulog in June 2007 and began to update some of the facilities. In December 2008, an assessor from Visit Wales awarded 4 stars for the extensive refurbishment of Bron Heulog. Car parking facilities are available subject to space. We are unable to provide accommodation for pets. There is a no smoking policy throughout the house. Cash, sterling cheques (with guarantee card) and all major credit and debit cards accepted. The decorations are in the process of being upgraded so you may be pleasantly surprised by the changes you find. We offer a 10% discount for third and subsequent visits. We also offer a 5% discount off your next visit if you reccommend a friend who stays 2 nights or more. Packed lunches are avaiable for guests, we do ask for prior notice of this requirement. Please click here to view a copy of our terms and conditions.